American Pancake: Andrew Bird- 'Break It Yourself' -Album Review- An Immaculate Musical Conception. 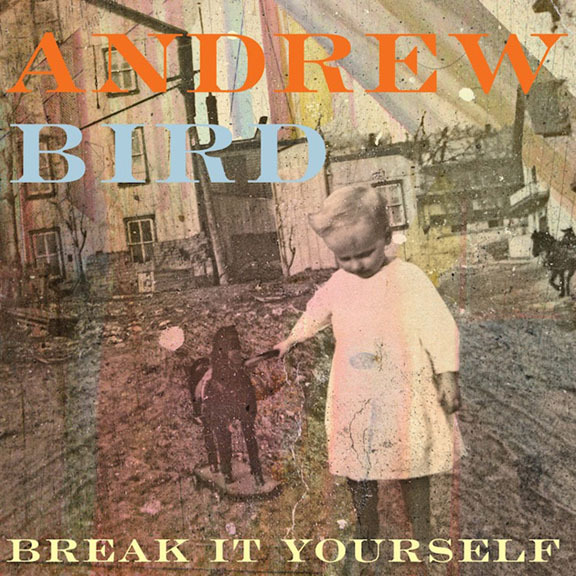 Andrew Bird- 'Break It Yourself' -Album Review- An Immaculate Musical Conception. Andrew Bird is a strange bird, indeed. I mean, how many 38 year old musicians can truthfully say that they have been playing music for 34 years. He can and as you listen to 'Break It Yourself', his latest foray into soul searching and self discovery, you may consider Mr. Bird to be more of a magician than musician as he seems to effortlessly conjure up his intriguing aural alchemy of sounds with elements of jazz, indie folk pop, Calypso and Scottish folk. Self produced and recorded in his barn in Illinois, Bird has created songs that feel very immediate, often times like live performances. Almost every composition has both spartan, simply elegant passages that give way to pretty dense productions or like the bipolar Give It Away can feel like two songs at once moving from folk pop to a kind of progressive folk thing. Lazy Projector with it's dreamy cadence and Bird's earnest vocal performance sounds so cozy and terribly sad at the same time, (some of the swelling sounds could be a violin against a saw). Near Death Experience has a great percussive sound that could be paint sticks against a wooden box moving this cafe pop song seductively along. It has a smooth groove and a pop undercurrent that could be part 60's French Riviera Hip, part Mentos commercial. Hole in The Ocean Floor feels like a saga of sorts, it's emotional narrative sways you with it's beautiful lush string bed. The chorus with Birds vocals intertwined in the string bed has an art rock feel. At times he reminds me of David Byrne. It plays like a Talking Heads Opera. Lusitania with it's almost Winchester Cathedral whistled melody is lush and lost at sea and enhanced by a female vocalist. Orpheo Looks Back needs to be in the next Wes Anderson film. With it's plucky demeanor and stirring strings it is full of bluster, it rocks too as a fusion of Scottish folk and country and more. It has that transcendent quality that you feel in some of the best Van Morrison songs. Eyeoneye is a surprise. Of all the songs on this album it is the most playful with a decidedly 60's Brit pop feel. Sifters feels less like a composed song than something that just happened... like some immaculate musical conception. A nontraditional love song that seems to move through worm holes, "what if we hadn't been each other at the same time... would you tell me the stories from when you were young and in your prime... would I rock you to sleep... would you tell me all the secrets you don't need to keep... would I still miss you." 'Break It Yourself' is sonically diverse and enchanting. Every song is so well rendered that you hear more nuances the more you listen. The clear masterpieces, to me, are Orpheo Looks Back and Sifters. Andrew Bird has created haunting songs that literally transport me to some other place, but then magicians can do this sort of thing.